More than 11,000 people have signed a petition opposing the name of South Yorkshire's new airport. The former RAF Finningley is being redeveloped into a commercial airport and has been named Robin Hood Doncaster Sheffield Airport by its owners. But Doncaster councillor John Mounsey is leading the campaign to get the name changed to Doncaster Finningley Airport. An airport official said the rebranding would bring prosperity to the area. Cllr Mounsey said: "What's getting up the nose of thousands of people is that they supported Peel Holdings in the inquiry into the [need for the] airport. "We are fully behind the airport, but they should have had the decency to consult with the people of Doncaster before they came up with the name. "We're the ones who are going to use this airport, it's our town and it's an insult to the people of Doncaster." Sharon Bennett, the airport's marketing and community manager said: "This petition is old news, it was raised in April and we thought we'd addressed the issue then. "We're very happy with the effect the rebranding has had with commercial airlines and the aviation industry. The name Robin Hood is being welcomed by the general public, particularly abroad. "It has to be appreciated the name of an airport has a job to do, it has to raise awareness not only of the airport, of the whole area. "If Robin Hood airport is to bring jobs to the area it has to have some commercial impact. "This is a commercial decision, we have to make this airport work." 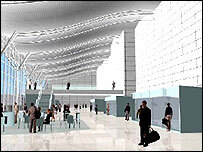 The airport is due to open in the spring offering flights to a large number of European destinations.